Mangled Fly Media, was conceived to bring my experiences and skills in outdoor imagery and video to a broader market. Whether you’re looking to purchase a photo for your home, license one for a publication, or have me document the trip of your dreams, it’s my goal to bring a fresh and unexpected approach, coupled with stunning subject matter. Captain Jon Ray has been fly-fishing since the age of 15 and has guided fly anglers in Michigan and Colorado for the last decade. Jon’s first love is chasing large resident trout with streamers & dry flies. The Upper & Lower Manistee, Muskegon and the Pere Marquette are among his favorite rivers. Jon Ray currently works for Hawkins Outfitters. Jon has fly fished around the world including Alaska, and New Zealand. Some of his favorite fishing spots outside of Michigan include: stripers in Maine, trout in Montana, and snook in Florida. He brings all this experience to your fishing day with an enthusiasm that is contagious. Jon is totally focused on helping his clients land that trophy chrome steelhead, large wary brown trout or dominate male salmon of your dreams, while also improving their fishing skill level. Jon Ray is on the Scott Rods Pro Staff and who is continually pushing the state-of-the-art in fly fishing with new techniques, tactics, and strategies to enhance the fishing experience. Photo of Jon Ray courtesy of Kevin Feenstra. The son of a professional bass fisherman, Erik grew up with a fishing rod in his hands. At age 16 he discovered fly fishing and a lifelong love of chasing aggressive fish on the fly started. Erik targets aggressive species – from steelhead on the swung fly to trout and smallmouth bass on streamers. That powerful take is what captivates him. In recent years, Erik has gravitated to two-handed spey casting and swung flies. He especially loves the big water of West Michigan, including the Muskegon and Manistee rivers. Erik started his career as a photographer, shooting a wide range of subjects and also doing professional retouching. Later he moved into the video production field both shooting and editing and most recently managing a team that produces award-winning work for Fortune 100 clients. career opportunity brought him to Traverse City, where he now chases migratory and resident fishes…the more challenging the better. In the last 5 years, sight fishing to feeding Carp has become a favorite target in the summer months. His deepest fishing passion is swinging flies for trout and steelhead. During the spring, summer and fall, you can find him fishing soft hackles for trout on the local rivers. In the summer, you might find him faithfully waking some flies for steelhead. 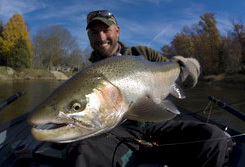 He is a truly devoted steelhead fisherman and does so pretty much year round, with fall being his favorite time of year. Professionally, Jon is a wine and spirits salesman for Veritas Distributors. If he offers you a drink from his flask, take it, as you can be confident that it will be delicious! Kevin Feenstra is a long time fishing guide, raised in Grandville, Michigan. Kevin grew up fishing every possible minute from a young age. After graduation from college, he turned to guiding over an office job and has never looked back. 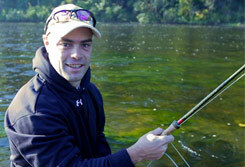 He currently staffs a reputable guide service on the Muskegon River. He has spent innumerable days chasing steelhead in West Michigan streams, and gained a reputation as a pioneer at swinging flies in Great Lakes streams. He continues to pursue steelhead every possible moment, but also enjoys fishing for any other predator fish that will take a fly. 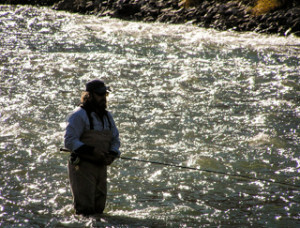 His flies have been published in numerous fly fishing magazines and books. He also has several instructional DVDs including “Searching for Steelhead”, “Big Appetite Smallmouth”, and “Striking Steel”. He also is passionate about river photography, and actively maintains a photo website. Chances are good if you fish the Muskegon River, you may encounter Kevin on the water!